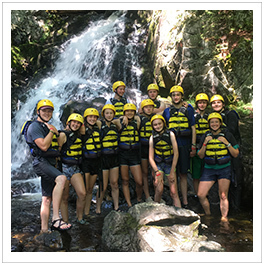 Since 1994, HVA (Hidden Valley’s teen adventure summer program) has provided 14-16 year old campers with these exciting, safe, and challenging opportunities. Available for all reasonably fit participants who enjoy the outdoors; no technical expertise required. Finding a challenging and well supervised summer adventure for a 14 year old young woman is not easy. The pressure to behave socially like a much older teen, or the 'insult' of being treated like a child made most ideas for an independent summer experience seem inappropriate or just unappealing to Sara and to us. Participants challenge their physical abilities in a well-supervised, upbeat atmosphere and develop friendships, self-confidence and leadership skills in the process. Trip leaders are college-trained, experienced in outdoor adventures, and support the Hidden Valley philosophy of personal growth through group interaction. Leaders are professionally trained facilitators who possess relevant outdoor and safety certification, and enjoy work with this dynamic, energetic group of campers. It was a terrific program! My son gained a lot of confidence from the summer adventures, and still brings up the kayaking, hiking, camping, canoeing stories (from over a year ago) often! Groups of 7-10 teenaged (14-16) boys and girls set out on adventures lasting up to a week. Between trips, Hidden Valley Adventures is based in a log cabin on the summit of Ledge Mountain located on the 300-acre grounds of Hidden Valley Camp. A short hike from the camp's facilities- dining hall, health lodge, lake, etc.- the log cabin is well isolated from the sights and sounds of civilization. 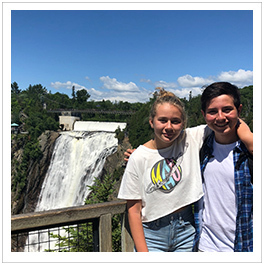 Hidden Valley Adventures meets the needs of teens who want more than a summer vacation away from home with their peers. The program promises to be different, memorable, challenging and fun. Those who take part often find they return home as different people. They have benefited from working and living together with their companions and communing with the great outdoors. All I can say about the adventure program is WOW! My non-adventurous daughter wants to hike, camp, canoe again. I only wish you had a family or adult version; I'd sign up first. We live in the city where it's hard to turn off all the external messages about how to be. Being in the woods with friends and in this beautiful setting was obviously very restorative for Emily. She grew up a little bit. She came back smiling and glowing! Hidden Valley Adventures was the single most trying experience of my life. It is the hardest I have ever had to push myself, the strongest I have ever had to be, and the most fun I have ever had. I wholeheartedly believe that who I am today was greatly impacted by my HVA experience; I am stronger, more confident, and more outgoing. This program was a wonderful experience. In addition to gaining outdoorsmen skills, I had the opportunity to make very close friends, whom I speak to or email regularly. The activities in HVA were exciting, demanding and showed me I could master challenges which I never thought I could do. This was a life lesson which will help me with different types of challenges I may encounter throughout life. A city kid, Daniel went out and did things I never thought of him doing. The kids really gain independence during this program (with excellent counselors) and even do their own laundry. Plus, he loved Quebec. Two years later and dispersed around the world, the friends I made that month are still my family. I would recommend HVA to anyone who is interested in a life-changing experience and the best month of their life. Nora came home feeling proud of herself for roughing it through physical challenges and she had a lot of stories of fun times. I know she feels proud of trying and succeeding at new experiences. It wasn't always easy for her. She also loves that she came home in great shape!